Where is the River Tisza pilot study area? Why was the Tisza River Basin chosen for a pilot study? What are the flood hazards? The Tisza river basin at 157,186 km2 is the largest sub-basin of the Danube river basin (801,463 km2) and crosses five countries (Ukraine, Romania, Slovakia, Hungary and Serbia). The river has a total length of 966 km and forms the national boundary for several kilometers between Ukraine and Romania; Hungary and Ukraine; and Slovakia and Hungary. There is significant agricultural production in this area, including vineyards, orchards and arable land. Industrial activities are growing in the Tiszakécske region and tourism is rapidly growing especially in the larger holiday resorts of Lakitelek-Tőserdő and Tiszakécske-Kerekdomb. Experience from flood events over the past 10 years has shown that the existing, wholly engineering approaches to control flooding are no longer adequate. It has become clear that the causes and implications of such natural disasters should be considered in a broader sustainable development framework by taking into account the interrelated environmental, social and economic dimensions, and the relevant scientific results. At the start of this project, the time was right to take advantage of the substantial research programs implemented over many decades and the experience gained from past flood events, particularly those experienced between 1998 and 2001. 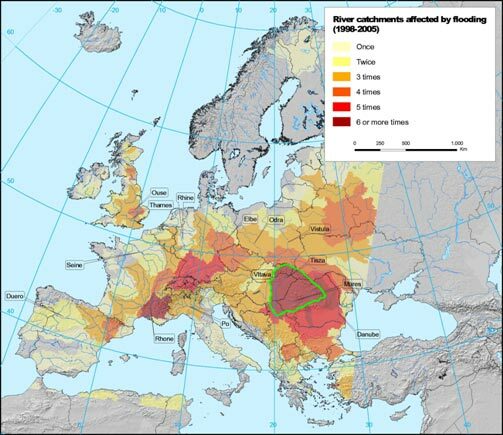 The communities along the River Tisza are at significant risk from flooding. In Hungary alone there are over 400 communities housing 1.2 million people on a floodplain of approximately 16,000 km2, which is protected by nearly 3,000 km of flood defences. 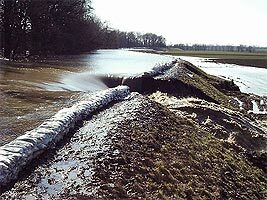 The upper parts of the river suffer from flash flooding, while the middle and lower parts suffer from very high and long-lasting flooding caused by the combined effects of upstream flows. These hazards became exacerbated due to drainage measures undertaken in the 18th and 19th centuries. These measures resulted in the river course being shortened by 40%, which led to increased velocities and riverbed erosion and a reduction in floodplain area from 7,542 km2 to only 1, 215 km2. Further information regarding flood events can be found here.